The names of Rouge Bunny Rouge things are always poetically mouthful. God forbid sheer lipstick be just sheer lipstick. It is Succulence Of Dew, ok? And this brown color shall be called "Perfume Of His Gaze". A sheer brown lipstick could be the most boring object in the world, but suddenly it becomes so mysterious and irresistible. I love sheer lipsticks and didn't have a brown one in my collection (really, really). Plus there was a 20% off code with free shipping (this is offered on Wondegondigo blog and still available). I wonder who could resist such a combination. 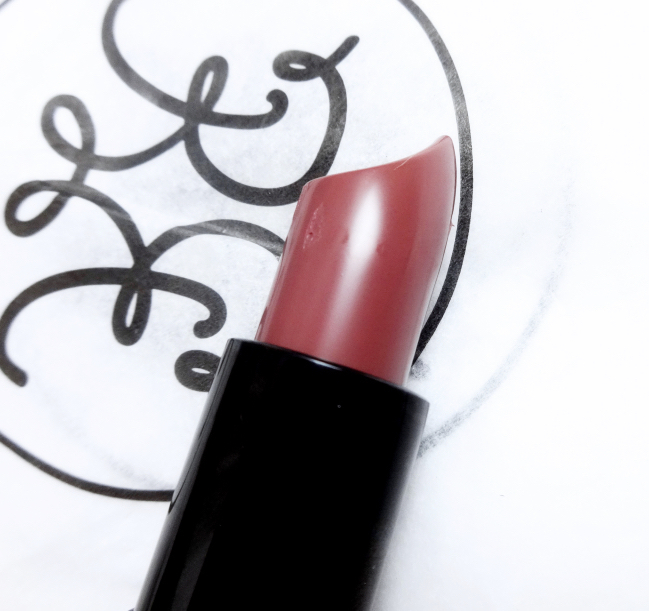 When it comes to color descriptions though, Rouge Bunny Rouge is always on point. 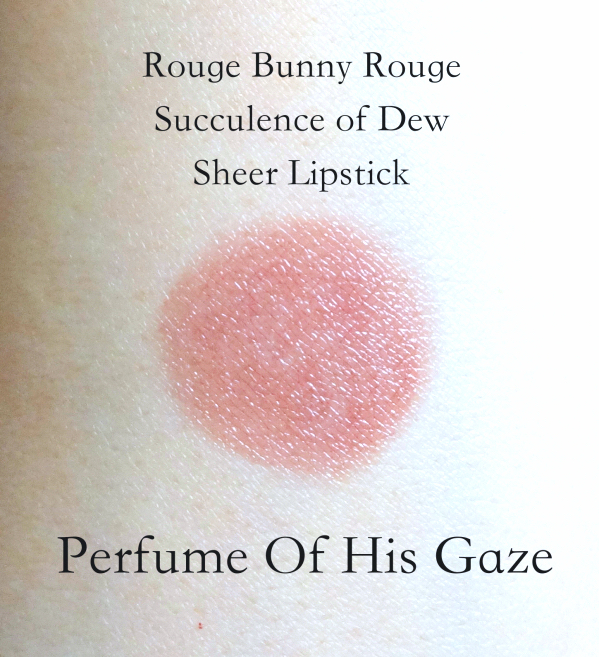 Succulence Of Dew Sheer Lipstick Perfume Of His Gaze is described as "Wet effect, Medium transparency, cool toned rose taupe", and I don't feel that anything should be added. Perfume Of His Gaze is exactly that. Well, it is brown, of course. It even resembles so many medium brown lipsticks that I owned in the 90's that were perceived as "My Lips But Better" shades (Back then people thought many things differently). I would instantly cringe if I had to wear them now. "Ew, that's so 90's. And I don't even have dark brown lip liners to go with.."
But, Perfume Of His Gaze doesn't make me feel that way although I don't completely exclude the possibility of myself being hypnotized by fairy words of Rouge Bunny Rouge. The formulation is truly gorgeous. In fact, it is so nice that my other favorite sheer lipstick formulas like Dior Addict and NARS Sheer Lipstick pale in comparison. 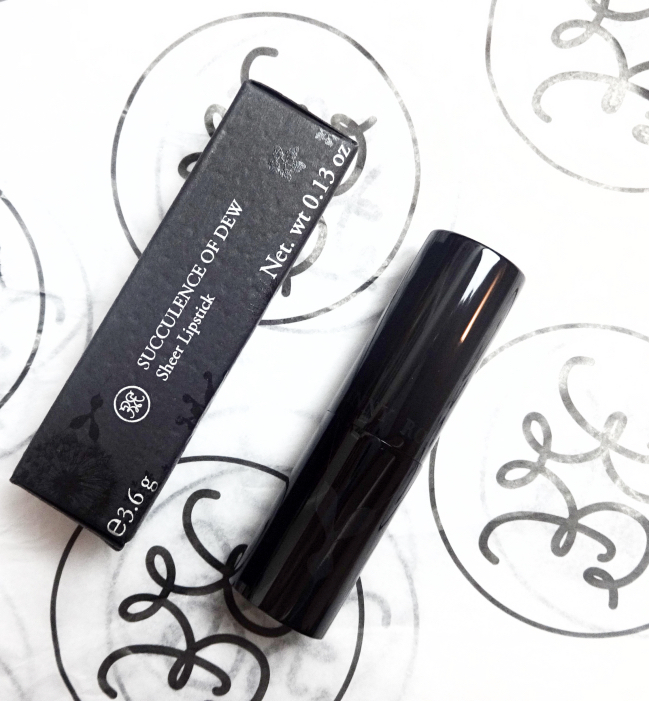 It has a perfect amount of slip, a very faint rose-like fragrance, and no paraben. It is moisturizing and hydrating for a long time, actually until you need to put on another coat - a rare thing regardless of the finish, you know? I wouldn't say it is all that sheer, though. It still provides a decent coverage. 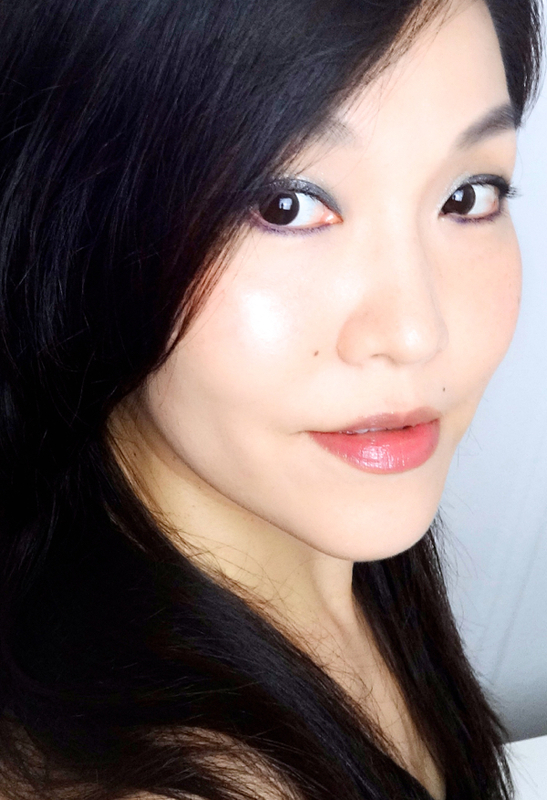 I guess (by the year 2015 standard) if it isn't completely opaque like NARS Audacious, it is a sheer lipstick. To me Perfume Of His Gaze is like the milkier browner version of NARS Sheer Lipstick Damage (reviewed). I need a flawless yet sheer base and certain eyeshadow pairings to pull it off. Which means a few extra steps in my routine, but I don't mind. I like this lipstick. 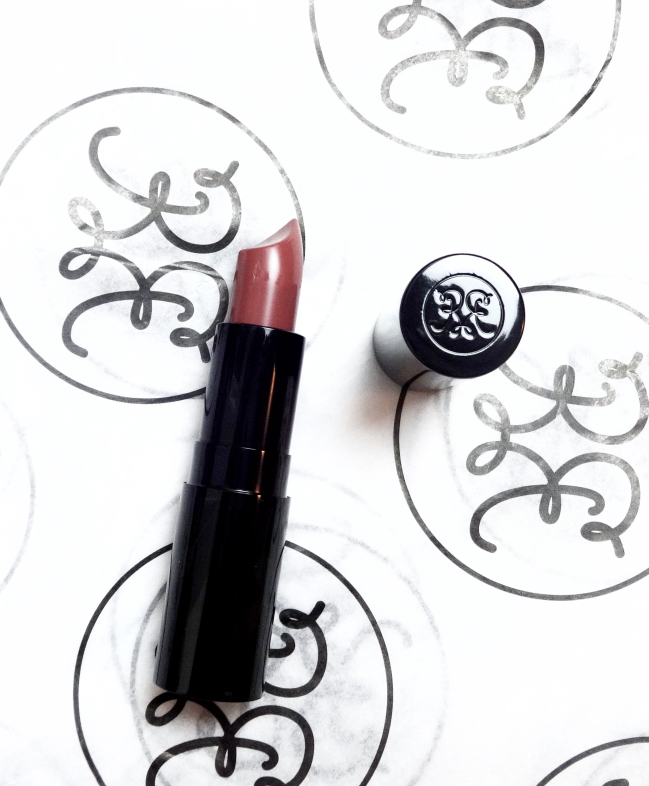 Any brown lipstick that strikes your fancy lately? It is indeed so beautiful, Lena! "Whim of Mine" is another great name! I am actually interested in trying some of the old colors (which are still avail on the web site), too. This is a lovely shade! I quite like brown lipsticks, more so when they are sheer and have a bit of red in them. Clinique Black Honey is the closest that I have to this. I have Black Honey as well, but it looks more plum than brown. Love it how it looks on me, though. I think the formula is probably the best out of all sheer-to-medium lipsticks I've tried in years. I haven't tried the old ones but am interested in them since they are still offered on the website. It's definitely not a 90s brown, Lena. This one looks really pretty on you... I might even be tempted to pick one up for myself! The new colors covers the all spectrums and look very pretty. That fuchsia pink is the star of the range, I think. It looks so modern and beautiful on you. I adore this formula, too. Thank you so much for the shout out and I'm so glad you got to use the code. PoHG is slightly grey on my lips. I think the slight translucency of the formula allows my blue lips to shine through to make the grey so strong when I wear it. Sounds gross, but I think it is such a modern and beautiful shade!! No, thank YOU so much for offering such a nice DC code for us. I also got the Starina blush totally enabled by you. It is a beautiful shade, too! Perfume of His Gaze... ah it sounds so poetic! This brown shade is definitely not 90's and it's so pretty on you Lena. I haven't worn a brown lippie in awhile. Perhaps I shall dig out my Chanel Rouge allure in Farouche. I love Dior Addict, but yeah, definitely better. :) And way better than Chanel Rouge Coco Shine if you're wondering. Really pretty on you Lena! I don't know, I went through a RBR phase a couple of years ago and it promptly ended hahaha. Never felt the pull to buy anything again for some reason! I love their pressed powder formulations (everything is so well done), but it's not like I feel I must have everything. They don't really churn out seasonal collections aggressively so maybe that's another reason. LMAO. Your intro cracked me up because I can't with these names. Maybe I'd be friendlier if RBR had a counter like everyone else but I believe most people when they say it's good stuff. This looks great but I'm not seeing too much brown! No browns for me as I've already spent almost a decade on them and it's time to make up for lost time with actual pretty colours, lol. This kind of name would go so well with the new (and annoying) revlon love-is-on ad tactics...I am imagining Antonio Bandera (or Fabio) as the poster man. This color looks quite pretty and office friendly though. Personally, I think RBR should keep this girly fantasy vibe going. It somewhat works well with their well executed product lines. But honestly, I'd like to made a PDF file with all the RBR names one day. It is a great name! Actually all the names from the lipstick range sound like they popped out of romance novels, which I don't mind at all! Definitely use Belly's code before it's gone. It think it is good until August. I wonder if I can use the same code again, because I want some more... ;p Neutral/warm lipsticks look so awesome on you and now I understand why after your metaphor.